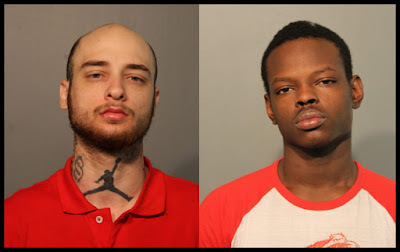 Two men are facing burglary charges after they allegedly broke into an occupied Wrigleyville apartment early Wednesday morning and then stuck around the neighborhood to use the victims' credit cards. Police arrested John Bonner, 24, and Jamal Rey, 20, near the Wrigley Field 7-Eleven store where a stolen credit card had just been used to make a purchase, police said. A man who lives in the 1100 block of W Addison hid in a closet and called his out-of-town roommate as burglars entered their unit around 4:45AM. Police said the unit had been completely gone through with two MacBooks, a wallet, credit cards, and a white suitcase stolen. When officers saw Bonner and Rey wheeling a white suitcase nearby, they became suspicious and conducted a street stop. Bonner, of the West Ridge neighborhood, was less than two months away from successfully completing parole after being imprisoned for unlawful possession of a stolen vehicle and aggravated fleeing. Rey lists a residence in Kenwood. Both men are due in bond court today. UPDATE: Bail for each has been set at $100,000.